| Three Cheers Pub Co. 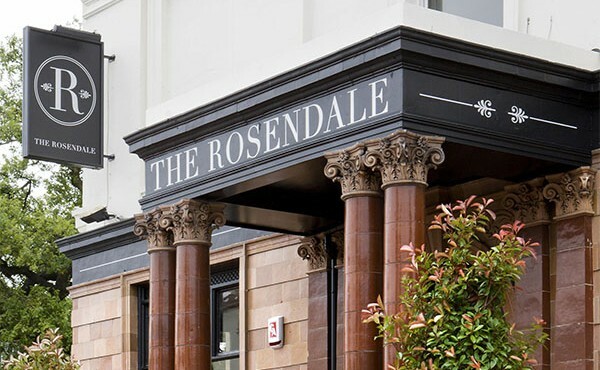 The Rosendale’s terrace has undergone a complete transformation. Where a few aged pub tables once stood is now a beautiful modern exterior drinking and dining area featuring bespoke seating, extensive planting, a refurbished boules pit, and new outdoor rotisserie and bar which will be open on warm, dry weekends throughout the summer. The terrace has been completed in time for the lighter evenings and longer days that come with the start of British Summer Time. The rotisserie chicken will be prepared with our special house barbecue marinade and served either whole, half or quarter with mouth-watering sides such as chicken dripping roast potatoes and Caesar salad. The outdoor bar will be serving local favourites on draught such Meantime Pale Ale and Camden’s Hells Lager. The work has been undertaken by our good friend Ross Clarke at The Beer Garden Co., who refurbished The Avalon’s beer garden last year, using native British timber such as western red cedar. We have introduced two epic feasting tables with larch log benches, each seating 20 or more and which can be booked in advance. Individual areas of high seating for drinkers and low banquettes for diners are defined by bay and cypress trees, with white lavender, mint and thyme planted all around. For the competitive types, the newly refurbished boules pit will be a summer favourite. And don’t worry, the famous ping pong table hasn’t gone anywhere. The à la carte and bar menus will be available throughout the garden, plus the rotisserie chicken menu at weekends when the weather permits.